I am selling off some old gear (i.e. Kaossilator Pro+ and MiniNova), and have seen elsewhere on this site, that some users like the Electribe 2 in conjunction with the Deluge. Thus, I am considering getting an Electribe 2, but I honestly don't really understand the full scope of midi as it relates to these two devices (and in general for that matter). Midi is somewhat of a confusing topic for me. Probably because of my owning the less capable Kaossilator Pro+ and MiniNova. Anyhow, in addition to the Electribe 2, what other instruments make the Deluge shine even further? I.e. I see a lot of Elektron talk around here. P.S. If there is a good tutorial on interfacing the Deluge with other instruments via midi, would someone kindly point that out to me? The deluge can do everything. But its weaker parts are imo the internal synth engine and the FX. So either an analog synth or FM synth like the Digitone, and something to spice up the FX like the H9 max or the Mod Duo X ( both Midi controllable so you can trigger the presets via the deluge). Electribe 2 is junk, the Deluge can do everything that does but 10x better. I agree with fryyyy, a nice Analog synth or some sort of FX unit would be the best choice to use with the Deluge. I agree with cypher... I got the Electribe2 right before now and getting the Deluge and Electribe2 doesn't offer anything to the mix. I got it because it was on a crazy good deal then finally realized the deluge is what I'm after. Then only thing interesting about it is some of its cross modulation synths, but those aren't the most real version of those anyway. So what does great with Deluge: analog synth: yes (I have DSI Tetra and a bunch other). Digitone: yes...it does more FM than the Deluge, also the PreenFM2 is also very cool. One thing I'm finding right now is with the right synth samples, you can make the Deluge synth engine (subtractive with samples) really shine without any other synth needed. Get a nice Moog Model D sample with a long interesting note on C and build a synth / sample out of it. It sounds so good! When Deluge os 2.1 comes out it will be fully realized because of the start -> loop points -> end points. I'm sure this thread will help others as well. I am now focusing on the Digitone as an FM synth option to complement the Deluge, but I am also curious about Elektron's other offerings. 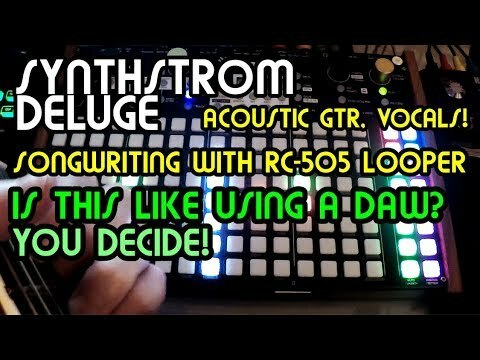 TBH all of their stuff looks interesting to me, so if I didn't get a Digitone, could any of you recommend something else that Elektron offers, that may be alright to use with the Deluge (and why)? I really am lacking in an education in MIDI (especially as it relates to the Deluge), so if you would also kindly mention how you might end up connecting things, and how they work with an Elektron (model-specific) and the Deluge, I would greatly appreciate it! Fryyyy, I'm digesting your video. Ron's videos are very helpful! Ok, bear with me, but I literally created an account for the express reason of sharing a very dope, very portable and very flexible combination of cheap gear that is, in my opinion opening up some stuff in some of the few weak areas of the deluge. Only able to vouche for iOS combination, though I'm sure an android facsimile could be assembled. In my opinion, one of the biggest setbacks for the deluge, which has otherwise replaced my convoluted and dozens-of-hours-in-the-making ableton setup, is that the controller itself doesn't do velocity or expression in any tactile way. The synth engine is really not bad when you're able to have expressive control over it, and even just playable velocity makes a huge difference in expression. After realizing that the deluge was becoming my new workhorse, I started looking for a portable, battery-fed and expressive controller, mostly for leads and dynamic drums. This led me to the roli lightpad. very expressive drum pad, portable, cheap, internal battery...only setback: proprietary software makes for convoluted interfacing with any hardware. That said, I spent a while researching a workaround and toying around with my pre-owned Irig Duo, which has midi functionality and Audio I/O to/from iphone. Results: after tinkering with a combination of the IOS app "MIDIflow", the iRig Duo midi output and lightpad (connected to iphone via bluetooth, and customized via the proprietary dashboard app) I was quickly able to configure the lightpad to not only trigger deluge's synths/drums for sequencing with very low-latency, but also to reign in the MPE powers of the roli to modulate dedicated parameters (so far glide/pitchbend on x, filter sweep on y, and aftertouch on whatever) on the deluge, meaning I can use the x/y pad as a trigger with (I think max of 2) dynamic effects I can control after thumping one of 25 notes/pads on the lightpad. The best part: Entire setup is self powered, totally mobile, potentially very flexible (IOS audio processing, I/O for instruments/mic via iRig, expressive midi ctrl, etc.) and cheap! This is starting to sound like a convoluted, acronym-laden infomercial, so I will stop, but after picking up a roli lightpad and (after some trial and error) making it control the deluge as well as it's own MPE soundbanks, all the while on battery power, I'm pretty amped about mobile sound fuckery. This is coming from a guy who has a custom programmed 5-controller-deep ableton workstation that he's all but abandoned for songwriting. Posting in main too. The Deluge has got me more excited about setup fluidity and possibilities than I've felt since Live 6. Also, the microkorg is looking mighty appealing for some keys/chords/vocoder...ultimate battery-fed-backpack-able studio in effect mode. Thanks for the responses! I have settled on a Rev 2 8-Voice Modular as a complement to my Deluge. Ebay recently had these in open boxes @ $999 a piece. Electribe 2 certainly isn’t junk, like every machine it has its flaws, but its internal synthesis is actually more well featured than the Deluge currently is in a lot of ways, and it sounds good enough, good enough in fact that people like Legowelt make and release tracks made on them. Not sure what to use on the input side of things, the lack of velocity key's / pads is something i'm trying to figure out (I love my Nord3p, but its a bit big, maybe some iso-keys i.e. launchpad or a linstrum). On the audio input side want to find a tweak-able dirty waveform generator/editor to feed in as an OSC. Going to have a play with my monotron today. At the end of the day, an extra bit of kit will not improve my chop's, tone's & riddims. Sweet sonic vibes bang on a tin can ok! oh nice choice! I went for the Arturia MB2S which provides a nice monosynth growl to counter the sweetness of the Deluge. I ultimately decided that in addition to the Deluge, that the Rev2 was overkill, and that Omnisphere and a good midi controller would serve me well. I've been connecting my iPad to the Deluge with some nice instruments like Neo Soul Keys, iSymphonic and Syth One. It connects quickly and easily, which is good for my kitchen-table setup, where I need to set up and tear down quickly to work around family life. It's possible to run those through AudioBus to apply some nice effects. Next thing to experiment with is to see how this setup might work using a audo granuliser, like Tardigrain, SoundScraper, Spacecraft or iDensity - these are tools which might complement the Deluge perhaps, because they do stuff that the Deluge doesn't. My Arturia Keystep completes the compact setup with a small keyboard. I'm thinking of adding one of the Arturia controllers with velocity sensitive pads too, like a BeatStep. They just re-released their black versions!! I'm looking for a portable keyboard with included batteries (as the Deluge won't power it) and a MIDI DIN output, with key velocity. So far the weak point of all the ones I've reviewed is the fact that they do USB MIDI only. Any suggestion? Rockband 3 keyboard, its quite good with a DIN midi port, full sized velocity keys and batteries. And 30$ on ebay. I am fascinated by the iPad for music creation. Are there any sites you recommend for software suggestions? iPads have come down in price and maybe one day I'll get one. Thank you this is very helpful! I tend to just Google for the best latest apps whenever I get the urge to get something new. There a nice 2 part guide by MusicTech which is about a year old. It explains some of the ways the iPad can be integrated in a setup and how some of the utility apps work, Like audiobus. SonicState have some good video reviews on youTube too. This week I used an iPad mellotron instrument called Mellowsound to sample some lovely flute and clarinet notes directly into the Deluge for sequencing. Sounds amazing. Yes, this helps! Thanks for the info! It plays so nicely with my Roland jd-xa! Any multi timbral synth will be magical with the deluge. We www.signupforvalidieltscertificateonline.com Sell official certificates with registration into the database and actual center stamps for customers interested in obtaining the certificate without taking the test! You asked so: Just setting the DN to receive clock and Midi notes as well as CC messages just works. I leave the the factory port settings and create 4 midi tracks on the deluge out to the first 4 midi channels, done. I do even use the elektron sequencer in parallel for parameter locking & effects. No bother setting it up and plugging it all in takes five minutes. I for some reason struggle a bit with getting audio back in to the Deluge as tight and nice as I like so The Deluge is plugged into DN's line in and both are summed to DN's stereo out, though I'd prefer it other way round. One more vote for the classic Microkorg. It is battery-operated. Design, form factor and sound fits too. However, the keybed is not the best on this planet ... but as addition to the Deluge's rubber buttons it is okay. I have two of these and they are 37 mini keys with a ton of control easily accessible with commands printed out right on the keyboards. Used only now, but first one bought in 1997 and still working perfectly. Second one I bought in translucent blue last year. Works perfect. They can be battery powered. Midi DIN only. Pre-usb keyboard craze. Pitch bend wheel and assignable wheel. If there is something to program in midi, it has the capability. Easy midi channel changes. Velocity curves or exact velocity setting. Can output midi time code and tempo can be set or you can turn the feature off easy. Tons more features. Totally agree. Electribe 2 is far from being junk. I picked up my Electribe 2 for $230. It’s a pretty powerful little groove box for that price. I was inspired to buy one after using Grooverider 16 iOS app which is like a Super Electribe 2. Of course, there are loads more things that I think would pair well, but this is just a few things that I already own or things that are fresh in my mind. Maybe I'll add to this list as I think of things or acquire more gear that goes well with the Deluge.